For this first go at it, the chosen topic is: "I remember when I started homebrewing"
My first brew day has arrived! I was very excited when I finally got off the couch and purchased my first set of brewing equipment. For some reason I was obsessed with finding the perfect (yet cheapest) brew pot I could find, but settled for something from Wal*Mart instead. Hey, I was brewing on a budget! My first attempt at homebrewing was relatively successful, despite all the beginner's mistakes I made. Successful in that what came out of the bottles a few weeks later was in fact beer and not just dirty water... Sadly I'm not sure I can say the same thing about my second batch. Those that were brave enough to sample my brew tried to be supportive and encouraging, but they weren't crazy for it. Most of them weren't really what I would consider beer experts though, so I didn't lose any sleep over their reactions. Screw them if they didn't like it, more beer for me! I remember my wife actually thought it tasted pretty good, and she isn't really much of a beer drinker. Then a gain, maybe she was just trying to be a team player. I clearly remember that my friend's wife was actually grossed out at the thought of drinking something that I boiled up on my stove and let sit in a "paint bucket" for a week in my basement before I pumped it into used beer bottles with a rubber hose. Bah! What did she know? Everyone is a critic! As I said before, my second batch came out terrible. I think I got lucky on the first go, and my lack of attention to detail finally caught up to me on round two. After that I took a year or so off, and finally got back into brewing about a year and a half ago. When I tried again, I brewed up an English Pale Ale (from a kit) and it came out great! 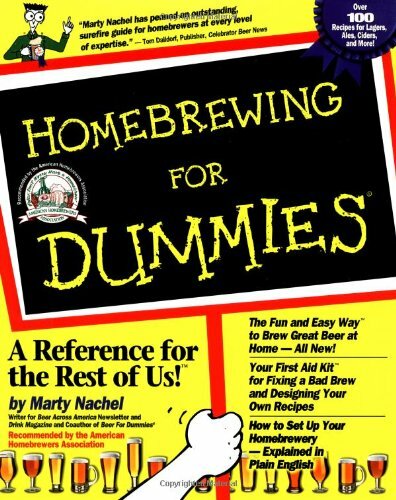 When one of my more critical friends said my beer was , "...much better than Bass Ale," to a bunch of the guys at the bar one night, I was instantly hooked on home brewing. I just needed the taste of success and a little validation. "I get by with a little help from my friends..."
I now have 5 successful batches under my belt, and plan to move on to all grain brewing pretty soon... Stay tuned and keep tabs on my as I progress! Flying Dog Brewery Kerberos Tripel from Flying Dog Brewery on Vimeo. Note: the toaster in the background did not come with the free sample! Some words from Flying Dog: Named after the mythical beast that guards the gates of hell… Kerberos is a traditional Belgian-style Tripel with a dark golden color has a sweet flavor with a dry and spicy finish. This nectar of the Gods is deceptively strong at 8.5% and is bottle conditioned for an authentic flavor. Style Description from our friends at BeerAdvocate.com: The name "Tripel" actually stems from part of the brewing process, in which brewers use up to three times the amount of malt than a standard Trappist "Simple." Traditionally, Tripels are bright yellow to gold in color, which is a shade or two darker than the average Pilsener. Head should be big, dense and creamy. Aroma and flavor runs along complex, spicy phenolic, powdery yeast, fruity/estery with a sweet finish. Sweetness comes from both the pale malts and the higher alcohol. Bitterness is up there for a beer with such a light body for its strength, but at times is barely perceived amongst the even balance of malts and hops. The lighter body comes from the use of Belgian candy sugar (up to 25% sucrose), which not only lightens the body, but also adds complex alcoholic aromas and flavors. Small amounts of spices are sometimes added as well. Tripels are actually notoriously alcoholic, yet the best crafted ones hide this character quite evil-like and deceivingly, making them sipping beers. What better time could there be to review another beer? 1. Appearance - A mostly clear, golden in color, with a slight haze. A few vertical rivers of tiny bubbles float their way up to the top to meet up with the thick inviting head. A rare behind the scenes look at my sloppy notes. FYI, Kerberos also makes for a fine paper weight. So get some in stock for your office today! 3. Taste - The Kerberos hits the ground running with a sweet start, but steady wins the race with a dry and slightly hoppy finish. This beer has something for everyone, malt lovers and hop-heads alike. That being said, I don't have much experience with this style, so I'll let you rack and stack this one for yourself. A less experience beer drinker maybe fooled by the flavor, which does it's part to hide the higher alcohol content of this beer. Not an over powering flavor, but a little too sweet for some perhaps. 4. Mouthfeel - The carbonation was adequate, but not as intense as the creamy head might predict. A light body helps this beer go down easy, but with the 8.5 ABV, perhaps a little too easy. Be careful! 5. Drinkability - As I said above, she goes down easy like Sunday morning, but remember the ABV! Very drinkable! Drinkability Scale from 1- 10: A solid 8.5! While waiting for my batch of Witbier to ferment and condition, I figured I'd look for a quality example of the style at my local package store. My goal, beyond getting a few cold ones, was to have a good beer to compare with my own as a point of reference. After looking over what they had in stock at CT Beverage Mart, and cross referencing for positive reviews/scores on beeradvocate.com with my trusty Palm Treo, I finally settled on Allagash White. I wasn't disappointed, this is really good stuff, but it set the bar really high. Would my own brew hold its own? On to the review! Some words from Allagash: Our interpretation of a traditional Belgian wheat beer, Allagash White is unique and truly refreshing. Brewed with a generous portion of wheat and our own special blend of spices, this beer is light and slightly cloudy in appearance, with a spicy aroma. Overall, it is a beer that is very drinkable and smooth any time of the year. Style Description from our friends at BeerAdvocate.com: A Belgian Style ale that's very pale and cloudy in appearance due it being unfiltered and the high level of wheat, and sometimes oats, that's used in the mash. Always spiced, generally with coriander, orange peel and other odd ball spices or herbs in the back ground. The crispness and slight twang comes from the wheat and the lively level of carbonation. This is one style that many brewers in the US have taken a liking to and have done a very good job of staying to style. Sometimes served with a lemon, but if you truly want to enjoy the untainted subtleties of this style you'll ask for yours without one. Often referred to as "white beers" (witbieren) due to the cloudiness / yeast in suspension. OK, my pour sucked, and I look silly stirring the bottle, but such is life. If only there were robots that could do this sort of dirty work for us. And what a wonderful world that would be. "It's a pipe dream, robots will never be pouring us beer!" Good Robot! Where can I get one of these things? Stupid Cylon! Lets just pray this evil contraption never becomes self aware only to launch a full scale nuclear war on man kind! 1. Appearance - A pale, cloudy, golden (straw-like) color, with an absolutely beautiful head that lasted all the way to the end. Using the proper pouring method allowed the inviting bits of curiosity to call out from their suspension within the delicious yet murky depths of the glass. The yeast worked their way down the glass in a ribbon like cloud, very interesting to watch, let alone drink. Can you see the happy little yeast work it's way to the bottom? This beer is almost as much fun to look at as it is to drink! 3. Taste - Home made wheat bread, with a zesty twang, possibly from the some orange peal seasoning? While I did not taint the brew with a lemon or orange wedge, a citrus flavor was certainly detectable. Think wheat bread with orange marmalade. Other seasonings came through as well, perhaps coriander or clove. A tasty beer, but perhaps a little understated. 4. Mouthfeel - A light texture, but the carbonation was not as strong as I anticipated, despite the magnificent head. It goes down easy, very crisp and refreshing. Another slightly blurry shot of the yeast working their magic. 5. Drinkability - I could enjoy a number of these on a nice Spring or Summer afternoon out on the deck while grilling up something to chow down. A great warm weather session beer. Drinkability Scale from 1- 10: A solid 9! A possible job for me at a local craft brewery! 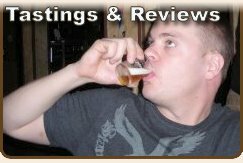 More free beer and a related product review! So stay tuned! 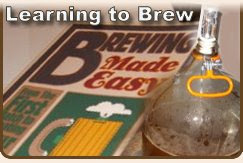 In the mean time, relax and have a home brew! Last Monday I had the day off and decided to bottle my Witbier. I was concerned about timing, after all Saturday marked the 1 week mark, and the airlock stopped bubbling right about then. Would waiting a couple of days hurt or harm the beer? I found this discussion to be very timely and relevant. How long do you let your beer ferment before you bottle? Apparently 2 weeks is the new conventional wisdom, but I suppose it really all depends on final gravity and such... Speaking of gravity, I just want to repeat, I love my thief! I've been using these flip top bottle now for a while now. The last 3 batches I've made have all found a home in the flip tops. As far as I'm concerned they beat the crap out of recycled bottles and that accursed two handed caper that came with my brewing equipment. But it's not all cotton candy and walks on the beach with these things. I would say a less than acceptable percentage of my bottles fail to provide a good seal, and some of my beer ends up flat. A friend at work suggested wetting the seals before capping the bottles, but that sounds like an opportunity to introduce something to the bottles that will kill the beer. I don't know, maybe I should say to hell with it and move straight to kegging... But there's something to be said about the portability and portion control offered by bottles. So, does anyone out there use the flip top bottles? And if so, have you had a problem getting good seals? What did you do to resolve the issue? I could use a little advice, but perhaps I should have asked this before bottling my latest batch... DOH! I also did a review of Allagash White to hold me over until my own Witbier is ready to roll, soon to be posted, so stay tuned! 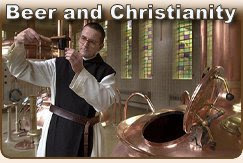 In the mean time, check out some of the comment traffic on Part 4 of my series on beer and Christianity.